The ALEX Series is robust, practical and very very affordable. Hauptstadtkoffer ALEX – great looks – great price – great value. The Q-DAMM Series is fashionable and unusual design with a great price/performance ratio. Four rubberised 360 ° smooth-running double wheels (ball bearings) for very high rolling comfort. In a range of 11 matt colours and sizes ranging from 55cm (45L) to 75cm (130L max). Single cases or 3 case sets. Polypropylene a super-light and particularly robust material. Hauptstadtkoffer Q-DAMM unique style and great value. The WEDDING Series is beautiful, elegant, practical and robust. A perfect travel companion. Hauptstadtkoffer WEDDING classy looks, functional and very affordable. 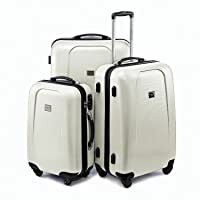 If you are about to travel, the number one thing you should do is to choose the right suitcase to pack your belongings in. Nobody wants to see their luggage torn apart on the carousel with clothes hanging out from the ripped part. In order to avoid that unpleasant experience, make sure you choose a good quality suitcase. Look at it as an investment - better pay more now if you want your valuables to remain your property. Acrylonitrile Butadiene Styrene is usually combined with other materials to make a stronger suitcase. ABS by itself is cheaper than the other materials because it has a low - level strength. If you consider to get your hands on an ABS suitcase, you better chose one in combination with a stronger material like polycarbonate. Polycarbonate is a lightweight material. It is impact resistant which means your suitcase will flex upon pressure from other suitcases and will not break. It is almost impossible to break, that is why it is used in items such eyeglasses, CDs and even bulletproof glass. Polycarbonate offers the highest level of strength and guarantees your suitcase will remain safe in any circumstances. 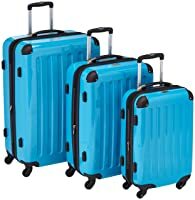 If you travel often and you need a reliable suitcase, a polycarbonate one will do the job for you. Polypropylene is the lightest of all the materials. It is flexible as well, so it will give extra protection to your belongings. It is not as flexible as polycarbonate, but is still better than ABS and PVC. The main benefit of it is that is extremely light. 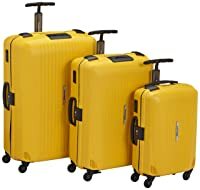 If you are in hunt for a low -weight suitcase, that is the perfect one for you.